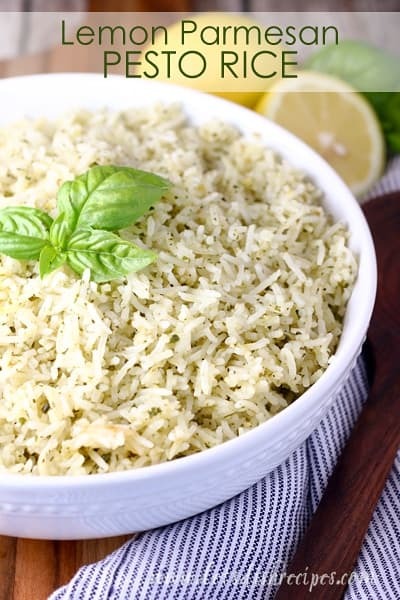 LEMON PARMESAN PESTO RICE — Rice is cooked in chicken broth and lemon juice, then tossed with basil pesto and Parmesan cheese in this easy side dish. When it comes to favorite side dishes at our house, potatoes and rice definitely top the list. But honestly, that can get a little boring. So I’m always looking for new ways to dress up those dinner-time staples, and this Lemon Parmesan Pesto Rice is a family favorite. I recently made a batch of fresh basil pesto and wondered how my family might enjoy it mixed with some Basmati rice and lemon. Of course, I had to throw some Parmesan cheese in too! Needless to say, it was a huge hit There weren’t even any leftovers–and I almost always have leftover rice. The best part (besides tasting amazing) is that it was so easy! I cooked the rice in my rice cooker while I prepared dinner, and just stirred in the other ingredients right before serving. Of course, you can also cook the rice using the traditional stove-top method. 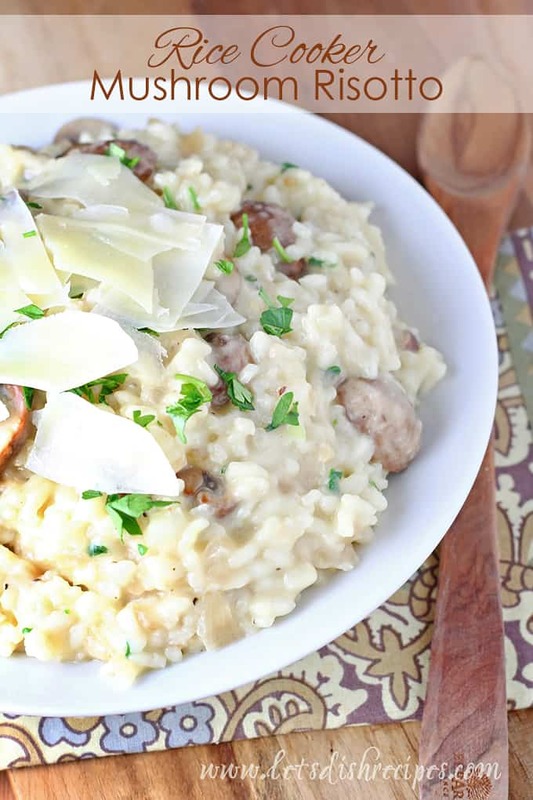 We love Basmati rice, but you can use long-grain white, Jasmine, brown–whatever you prefer! 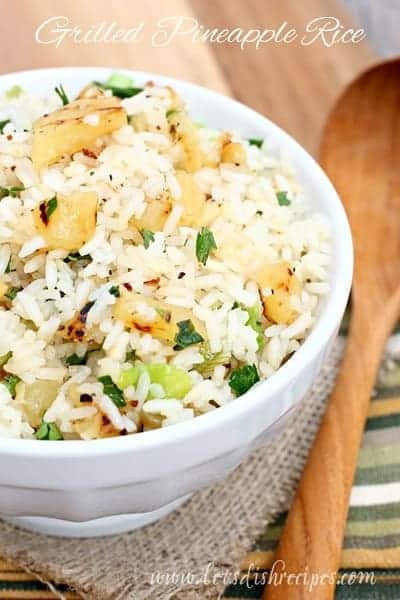 No matter what kind of rice you use, this simple recipe is a great way to add some variety to your side dish repertoire! 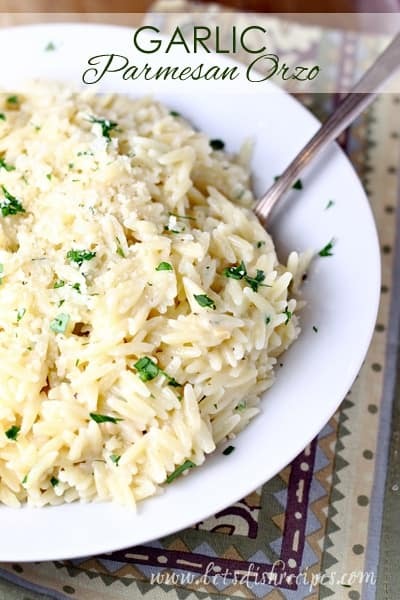 Be sure to save this Lemon Parmesan Pesto Rice recipe to your favorite Pinterest board for later. 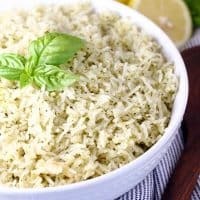 Rice is cooked in chicken broth and lemon juice, then tossed with basil pesto and Parmesan cheese in this easy side dish. In a medium saucepan, combine rice, broth, butter and lemon juice. Bring to a boil. Reduce heat. Cover and simmer for 20-25 minutes, or until all of the liquid has been absorbed. Alternately, this step can be done in a rice cooker. 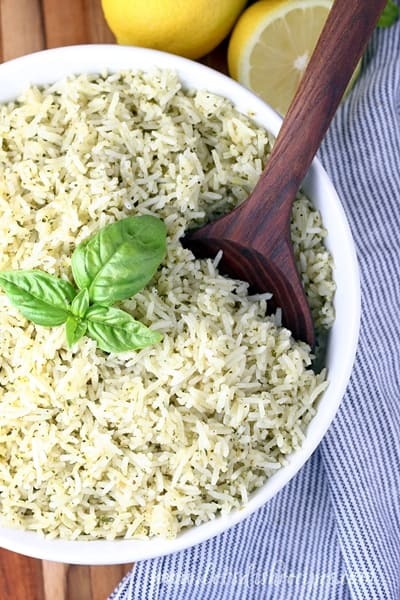 Remove rice from heat and stir in the lemon zest, pesto and Parmesan cheese. Thank you, Danelle, for creating recipes that are adaptable to my cravings. Going along with my current cilantro obsession… After making cilantro pesto in place of basil pesto, I substituted lime juice and lime zest for the lemon. Turned out perfect. Full of flavor. Great compliment to my tequila lime chicken!